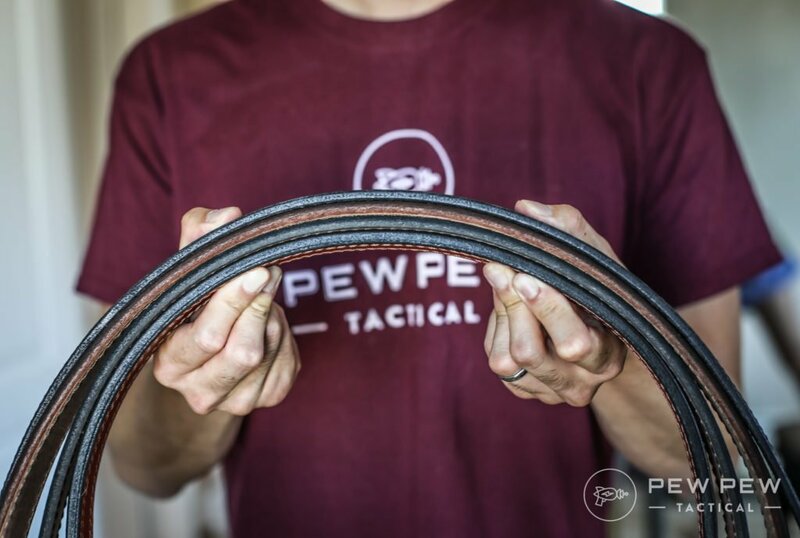 Looking for the perfect gun belt for concealed carry and the range? One that’s sturdy to hold a loaded handgun PLUS mags…but isn’t so tactical that it gives you away? We’ve got you covered with some of the top brands out there. 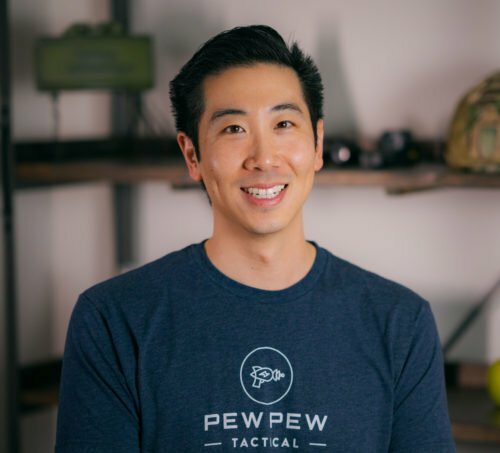 We’ve worn them for CCW, at the range, and during competitions. Updated with some nylon belts too! The Daltech Bull Beltwas the thickest of all (by my guess of 50%) and I have no doubt will stand up to years of use and abuse. Price is fair too. If you’re looking for the toughest belt out there to carry A LOT of gear or if you’re really ROUGH on your kit…go for the Bull Belt. The leather is nice and stitching is also very strong looking. No one will be able to tell it’s a gun belt. 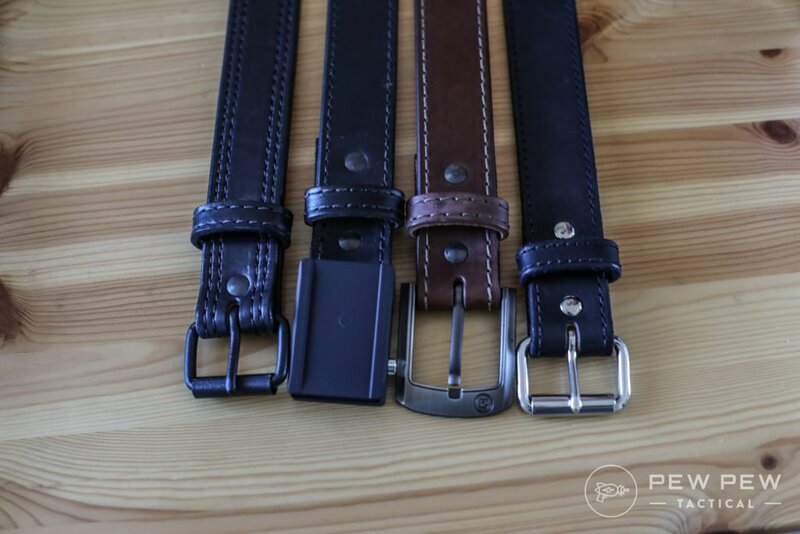 The sizing is also easy to figure out…add 2″ to your normal belt size. But keep in mind that because it was so thick it sort of felt like I had a small hula hoop around me when I walked. The feeling went away as I got used to it. So maybe it’s not the best pick if you’re simply carrying CCW and a mag. But if you’re looking at a 3-Gun competition where your belt has to hold a loaded pistol, rifle mags, pistol mags, AND shotgun shells…you can’t go wrong. I really like Crossbreed Holsters (see my Best Concealed Carry Holsters) so I wanted to check out their belts as well. I ended up getting two of their models, the Executive with a standard buckle. Again, the leather was great and so was the stitching. I’m sure with their leather-backed holsters they’ve got that part down. It’s less thick than the Daltech so it didn’t feel like I was wearing something super sturdy around my waist. I went with 2″ above my normal pants size. Pricing is steeper, especially for the Crossover…but you’re paying for a more polished look. I especially like the small CB logo on the Executive. But…for the first few days I wore either…it CREAKED like no other. It settled down after about a week and I get the feeling I could have put some leather oil on it to help. But I felt like a rusty tinman for a while. If a sleek look isn’t a priority…their slightly more affordable Classic belt might be for you. One of my first “stealth” looking gun belts I got to test out CCW holsters. I chose the Relentless Tactical Belt since it has impeccable ratings on Amazon. At the time of writing it has 2800+ reviews at an average of 5 stars. It’s almost indistinguishable from a normal belt except that it’s much sturdier and could hold a loaded handgun and two mags on the side with ease. Its the thinnest of the bunch so it fits the bill for something more comfortable for people who are CCW-ing. I got one 4″ above my normal waist-size. The drop-down ordering tool helps you out immensely. The Relentless Belt is what I would recommend for a no-frills concealed carry belt that can do some double-duty at the range or competitions. If you don’t want to go leather and want the super simple and effective COBRA buckle…we’ve been hearing about Blue Alpha Gear for quite some time now. Now we have them in hand and are trying them out for EDC, range, and competition use. So far so good! Our favorite one is the Hybrid Cobra EDC. What makes it Hybrid? The female end of the Cobra buckle is smaller to fit through “normal” pants. This makes it a lot easier if you’re not sporting tactical 5.11 pants all day long. But if you are sporting thicker belt loop pants…you can’t go wrong with the more robust feeling regular Cobra EDC Belt. 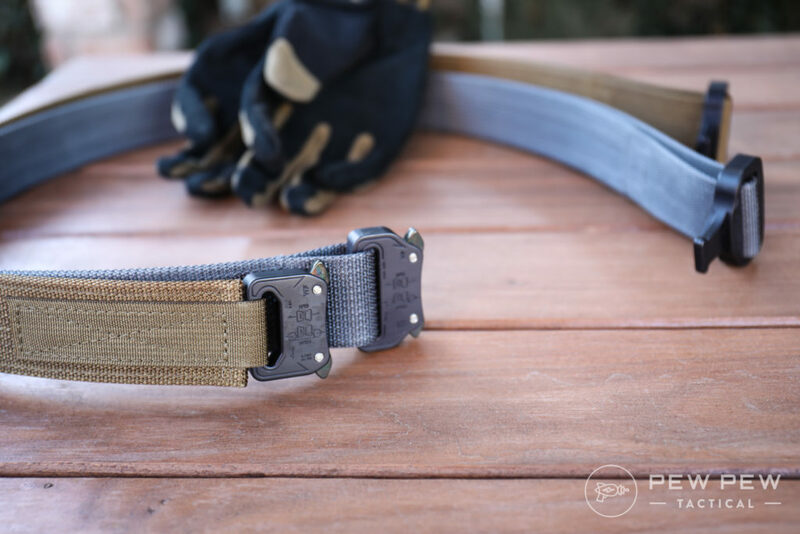 Lastly…if the buckle is too thick and you want a simple nylon EDC belt that won’t warp…try out their Low Profile version. 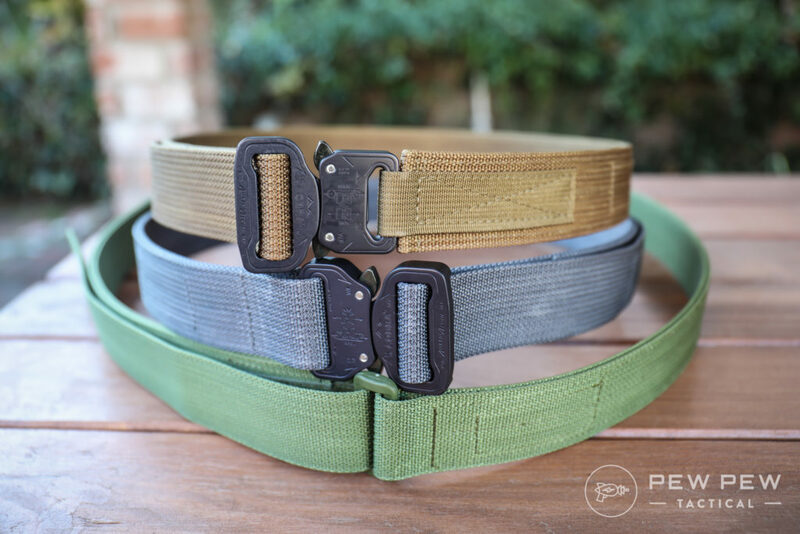 There you have it…our roundup of some sweet concealed carry belts. Which one did you choose? Or do you have another candidate for the best-concealed carry belt? And if you don’t have a go-to holster yet…check out our Best Holsters for Concealed Carry. What’s your thoughts on the ccw belts with the strip of steel in between ?? Come on Snowflakes, must you re-discover the wheel when the answers were forged 30 years ago? Give me any one of those belts and I’ll wear it to change the oil in 2 vehicles, and what do you get(?) a scratched up belt, big time. Now go get any of those belts in shark skin and 10 years later that bad boy will be worn but show no signs of abuse, only use. 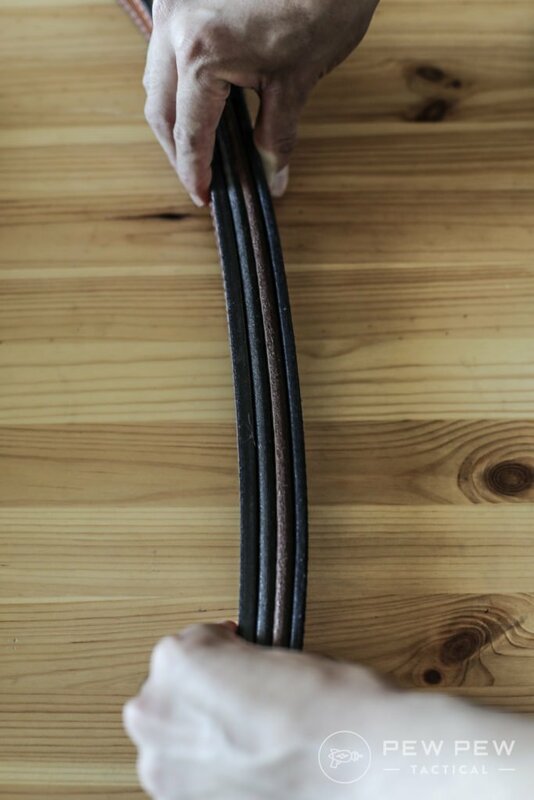 Bullhide Belts. Best ones I’ve found and you can custom order any variation you might want from plain, non-stitched to a Revere Buckle and tooling. I’ve got 3 and they will last years.